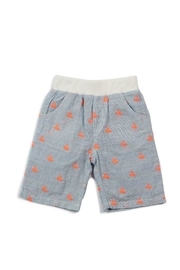 These shorts are a simple pull on or off with an elastic waist band. Bright orange nautical creatures printed on a sky blue background are unforgettable. Match with the Parker Nautical Romper for a Big Brother/Little Brother moment! Machine washable.